France, 1991, 98 minutes, Colour. Yvan Attal, Kristin Scott Thomas, Charlotte Gainsbourg. 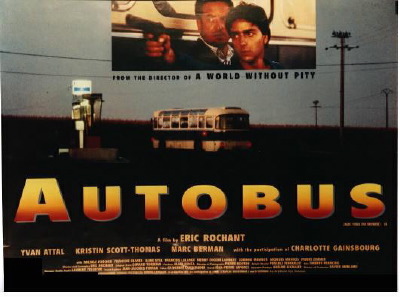 Autobus (Aux Yeux du Monde) was written and directed by young French director Eric Rochant (World Without Pity). It focuses on an ordinary but disturbed unemployed young man, eager to impress his girlfriend, anti-authority, risking everything in an ill-thought out plan to take a school bus and keep the students hostage and make the driver take him to his girlfriend in a distant city. The film does not explain Bruno, the central character. Rather it presents him, sketches some of his background, shows him during the taking of the bus and the effect of the experience on him. Focus of attention is also given to the teacher (played by British Kristin Scott-Thomas? - Under the Cherry Moon, A Handful of Dust) and the bus driver. The film also highlights the experience of the children, their fears, reassurance during the ordeal. The film is often unpredictable in its presentation of its characters - at times somewhat drawn out, but interesting in its portrayal of the characters and event. A theme song, `Free', sung by Stevie Wonder, begins and ends the film. 1. Impact of the film? Its original title: To the Eyes of the World? Autobus as more appropriate? 2. The credibility of characters, events? Behaviour? Audience involvement and identification with characters? 3. The French town, French countryside? Characters? Authorities? The editing, the pace, the use of the bus and the French roads? The theme song, `Free'? 4. The portrait of Bruno, 22, in himself, in the town, meeting his brother at the bus, idle with the friends in the town, talking about breaking and entering, the phone calls to Juliette? Love, his crassness? 5. The plan, the gun, the beginning of the day, getting up and his determination, warning Sam not to go to school, meeting the bus, his excuse, getting on? 6. Drawing the gun, the reaction of the driver, the teacher, the children? Bruno as angry, irritable, moments of frenzy? His reaction to the children? The choices to let some go? Behaviour to the teacher? His own resentments, the past, against schoolteachers, authorities, the fact that he was jobless? His anger towards the driver? Fretting, listening to the radio, his own fears? 7. The motive, the plan, defying authority, listening to the radio, wanting Juliette to listen, the phone calls to Juliette, his declarations, her scepticism, her being touched, her change of heart? The phone call to Sam, talking with the police? Revelation of motives, confusion? 8. The bus journey, his treatment of the children, their fright, hungry, the boy getting the food - and stealing some food because he had no money, the shop owner and the danger to the children? The blind couple and reassuring them? Going to get food and drinks at the bar, the laughter of the men in the bar, his destroying their car? The later reaction, to the bus driver, his saving the bus driver with the gun? His story of the Stinking Martian? The children's interest in the story, being reassured? 9. The change in Bruno, Juliette and her reactions, his growing despair? The children and their fear, the bus driving off, left with the two children, throwing the bullets away? Taking the children to the phone? His return, his interaction with the teacher, talking, her controlling him like a teacher? The clashes with the bus driver, hostility, the bus driver trying to outwit him, being passive? Finally the bus driver letting him off before the police came? His going to Juliette, his arrest and no resistance? 10. The portrait of the driver, in himself, 20 years, his reaction to Bruno, trying to defy him, driving the bus, the issue with the gun? Giving him the keys? Sleeping? The chances taken? Driving off, leaving Bruno with the children? Bruno's return and saving him from the people at the bar? His driving the children home? 11. The teacher, her work, controller, relationship with the children, controlling them, controlling Bruno? Taking the gun when the children took it? Sympathy for him? Handling of the situation with the child stealing the food? The end - and the effect of the experience? 12. The portrait of the children, ordinary, the day going to school, change, the children being let out? The mixture of fear, adventure, stealing the gun, listening to the story, becoming more confident with Bruno? Going to the phone, talking in the phone - hoping that it was their parents? The fear of the two girls left with him at the end? 13. The picture of Bruno's family, the mother, the comments on her reactions - the media? Sam, love for Bruno, his appeal on the phone? 14. Juliette, her work? Her friends, family? The letter, in love with Bruno? Their discussions, her uncertainty, her reaction to the news, accessory, change of heart, hanging up on him? The finale with his arrest? 15. Audience involvement with the episode, identifying with Bruno and his motivation, with the children and the teacher? The objective decisions about what he had done? More subjective decisions about him, his motivation? Moral issues, justice? The authorities and their stances?